Two-Sentence Summary The team at the 12th precinct investigates the murders of a man and woman who bear disturbing resemblances to Esposito and Lanie. The intimate connection to the precinct leads Castle to believe that Jerry Tyson—the infamous 3XK—is behind the murders, even though Tyson is supposed to be dead. “Disciple” was unlike any other episode of Castle I’ve ever seen. We’ve been given chilling episodes before, suspenseful episodes, even gruesome ones. But we’ve never been given an episode so deeply unsettling, so psychologically disturbing. It put the audience and the characters on the same level—one step behind the killer, frantically trying to put together clues until the realization crept up on us with an overbearing sense of dread. Of course it was 3XK. It made perfect sense and yet was perfectly shocking at the same time. That’s a hard balance to achieve, but writer David Amann seemed to strike that balance with ease. I also liked that there was a balance between dread and levity throughout the episode. TV—much like life—can’t be overbearingly tense at all times. So we got to see Castle and Beckett bantering about honeymoon locations and Castle bristling at Dr. Nieman’s use of the word “potential” when it came to his looks. The small bits of light amid the darkness of the episode never felt like drastic tonal shifts; they felt like realistic breaks in the tension. Without them, the hour would have felt oppressive. Even with the small moments of levity sprinkled throughout, there was no escaping the chill this episode put in your bones. It was there right from the first shot of Lanie’s doppelganger, standing still on the docks until we came to see that she was actually hanging there—her feet just inches from the ground but telling us all we need to know about her horrible fate. Rob Bowman’s direction and Robert Duncan’s score combined to make every nerve in my body feel like a live wire in that moment, and the feeling didn’t let up until the promo for next week’s episode started. Every member of the 12th precinct family had their moment (or several) to shine in this episode. I’ve said it before, but it bears repeating: For as much as I love a lighthearted or nerdy episode of Castle, my favorite episodes are the more dramatic ones. I feel like this cast really rises to the occasion when they get to play with serious stakes, and this case had painfully high stakes for all involved. Ryan got his big 3XK moment in Season Four’s excellent “Kick the Ballistics,” but that didn’t mean he was kept out of the action here—both in terms of the plot and the emotional arc of the episode. The scene when he discovered Esposito’s doppelganger was some of the best acting I’ve seen from Seamus Dever, whom I generally regard as the best of the Castle supporting cast (at least as far as the precinct is concerned). The way you can see Dever push his initial panic down in an attempt to be strong for his partner and friend was such a fantastically visceral reaction. I loved that Ryan’s first instinct was to protect Esposito. This episode featured some great moments for my favorite TV bromance (Ryan walking in on Esposito and Lanie’s “moment,” Ryan trying to get Esposito to share his feelings, etc. ), but that small detail of Ryan looking out for Esposito above everything else was my favorite because it said so much without ever having to directly say anything about their friendship. When all was said and done, though, this episode was about Lanie and Esposito. A few episodes ago, I complained that the two shared a scene without any indication of their history and/or current relationship, and I was so happy to see that rectified in “Disciple.” Jon Huertas and Tamala Jones simply shine when they’re in scenes that allow them to show off their surprisingly electric chemistry. In this episode, it was a gentle hum that infused each of their scenes with a very potent but also very natural intimacy. I believed their relationship—the slight hesitancy, the warmth, and the sense that it was a comfort just to know the other was there with them on this terrible journey. Each time they were onscreen together, I got the best kind of goose bumps. Jones really brought her A-game to this episode, which was wonderful since we’ve never had the pleasure of seeing Lanie with a real emotional arc before. I believed her fear because it was always present but not always overpowering. You could see it constantly on her mind, but you could also see Lanie pushing through it. I loved when she called Beckett to come to the morgue without Castle. For the first time, we got to see these two women interact as more than just relationship sounding boards. We got to see Beckett be there for her friend when she needed someone to turn to. Jones did such a great job of keeping Lanie’s panic just under the surface in that scene. Another standout moment was her final scene with Esposito, asking him with such restrained pain how long it would take for them to look at each other without seeing dead bodies. That was such a haunting line, and Jones delivered it perfectly. Castle and Beckett didn’t have the intense emotional arcs Lanie and Esposito went through in “Disciple,” but that doesn’t mean they were relegated to the background. Instead, they were at the center of interactions with some of the most captivating guest actors the show has had in quite some time. Annie Wersching made my skin crawl as Dr. Nieman. When she was alone with Beckett in the interrogation room, I was so disturbed I wanted to change the channel, but I knew I couldn’t look away for a second. And William Mapother brought every ounce of creepiness with him from his role as Ethan on Lost. I’m hoping that the end of this episode means we’ll be seeing more from both of these actors in the future. I loved watching Nathan Fillion in this episode—even more than usual. Even when he was in the background of a scene, you could see in his body language and his eyes the fear that only 3XK could be behind the murders. Without having to say anything, Fillion conveyed such a subtle but powerful sense of fear. And it all came to a head in his scene with Stana Katic in the file room. That scene was so tense—dramatic without being melodramatic. I understood Castle’s belief in the story making sense only if 3XK was involved, but I also believed Beckett’s desire to keep him from chasing ghosts like she chased ghosts for a decade after her mother died. That one line was so powerful and said so much about where this character has come since the show began. Beckett has grown and learned to live and love despite the ghosts and demons in her past, and she doesn’t want Castle to fall down the rabbit hole the way she did. It cost her too many years of her own happiness, and you could read all of that on Katic’s face when she delivered that line. When the theft of the files was discovered, the episode kicked into another gear of tension. I loved the callback to the first “3XK” episode all the way back in Season Three when they went to the hotel. I loved the chilling note in Nieman’s office. And, more than anything, I loved the terribly disturbing final scene. When the song started to play, I felt physically uncomfortable. It was the most unsettling sensation I’ve ever experienced while watching Castle. I’m still not sure if the song was supposed to represent something with special meaning to either of them (because Beckett’s reaction was visibly more terrified than Castle’s) or if it was just meant to tell them (and us) that 3XK was going to strike again whenever he felt like it. But no matter the nature of the song, it served its purpose; I didn’t even want to walk upstairs in my own house by myself after it was over. 3XK has always been my favorite Castle villain—even more than Senator Bracken. The episodes centering around Jerry Tyson are always some of the best in their respective seasons, and “Disciple” was certainly no different. I agree completely with your outline. But I wonder! I have a feeling that the character played by Mapother, who said he will live in his head ,not in jail. And was so intent on remembering every detail of his murders is really Jerry Tyson? Remember the plastic surgeon is his long time lover, she may have altered his appearance!! Or indeed Tyson may be deceased and his girlfriend is carrying on his legacy! “disciple” get it? Anyway Tyson may be dead or alive..the disciple may be his girlfriend or the watchman…or he could be sitting in jail, face altered by the good Dr. Wow what an episode! Your theory about Mapother’s character is one I’ve thought about, too, but I don’t want them to get rid of the actor who’s always played Tyson—he’s so good! But I suppose I’d take Mapother’s special brand of creepiness, too. Either way, I love that this story keeps me guessing all the time! During the scene where Beckett interrogates Niemann, I loved the emotion Stana Katic gave when it became obvious the doctor was off her rocker and so focused on making Beckett "perfect." Considering Beckett is confident in herself but has no need to use her beauty to get what she wants (with the exception of undercover), you could tell she was visibly shaken by Niemann's words. Your assessment of Nathan Fillion's performance is spot.on! He obviously hasn't been able to completely stop blaming himself for 3XK's escape – and that weighs heavy on him throughout the episode. I don't have anything to add about Tamala or Jon, except that it was GREAT to see them get more screen time and they knocked it out of the park. As always, loved reading your review, Katie! Thank you so much, Lindsay! And I loved all of your thoughts on this episode. I completely agree about Rob Bowman. He’s one of the few TV directors I can recognize on style alone—I don’t even have to see his name on the credits to know an episode is his. His style is so unique, and it works so well with the most dramatic Castle episodes. Great review. I think that song had some meaning to Beckett. I hope we find that if that is true. The guest stars this season have been amazing! Thanks! I totally agree about the guest stars—they seem to be even better than usual this season! Wow what an episode. Like you I was on the edge of my seat throughout the episode. 3XK is most definitely the ultimate villain. The banter throughout the episode however kept the tension from overwhelming. The dilemma of the honeymoon location was so real, and the suggestion of pick a destination and that will pick when the marriage will take place was so logical. I remember when trying to select a name for my first child, I’d been teaching swimming for some 15 years, so when a name was suggested it reminded me of the worst kids I’d taught. What would have completed this scene would be Castle or even Beckett saying, look sure you’ve been to all these places with your ex wives, but none of them were me. Maybe that is to come. Every relationship at the Precinct was on display here. The reveal between Lanie and Espositio that despite them not been exclusive (is that just a modern term for going steady) that Lanie has not been with anyone else. Ryan and Espositio showing the depth and strength of their partnership. Castle and Beckett in what seemed to be role reversal. Castle so sure of himself because as only he does, the story is what makes sense, it’s the story that makes all the crimes make sense. Beckett and Gates and the chilling warning from Gates that if the 3XK killer is really alive then Beckett needs to watch her back as the NYPD would do anything to make it go away. This makes the reveal that the 3XK files have gone missing all that more sinister. There are now two groups who could be responsible. Did the NYPD destroy the files, or is Jerry Tyson attempting to erase his past. 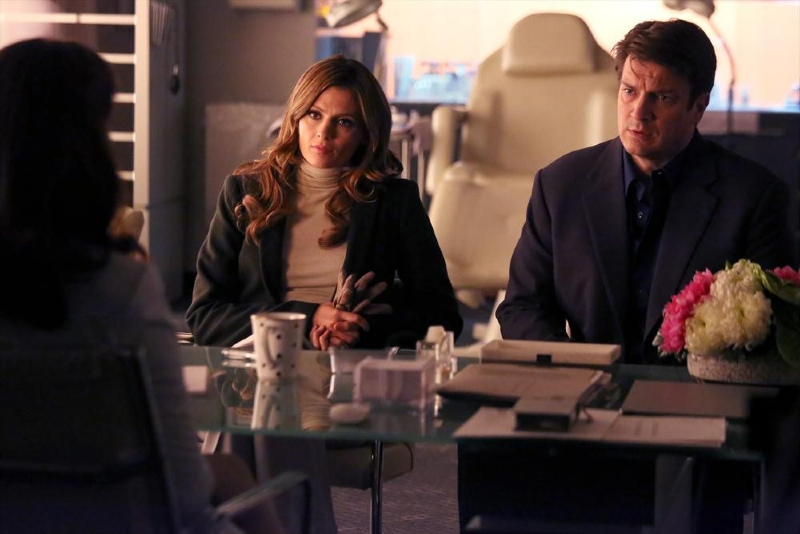 Perhaps the most memorable scene in this episode was the interrogation room with Beckett and Nieman. The room was charged with an intense energy. This is Beckett’s domain, this is where Beckett is her strongest and where she wields unquestionable power. We’ve seen in this room Beckett break the toughest and bring them to their knees. Nieman brought a new power dynamic to the interrogation room. This is someone who holds a mesmerising power in her own right, someone who can’t be intimated and someone who confronts Beckett head on, and wins. When Nieman stands up to leave I expected Beckett to take control and order her to sit down. That she didn’t gave a glimpse that in that moment Beckett was no longer the master. When Castle finds the USB key in the pen you knew he was meant to, the 3XK killer does not do anything by chance. Castle was meant to find the key. Beckett’s reaction when the song played and the intense fear on her face showed this song held a special meaning. The 3XK killer knows something about Beckett that no one else knows. Interesting time ahead. Thank you so much for the comment, Mark—I love reading your thoughts on each episode! Like you, I was completely enthralled by that interrogation scene between Beckett and Nieman. It was a meeting of such powerful, controlled, captivating women, and it was full of such intense shifts in power. To see Beckett dominated in the room she normally owns was one of the most unsettling things about this whole case. I’m so interested to see if we ever find out more about the song at the end. I feel like Stana Katic was directed to act like the song had special meaning for Beckett because her fear seemed so much more intense than Castle’s. But maybe it was just her realization that she’s the only one Tyson hasn’t directly come after yet, and now it’s her turn. Whatever that scene was supposed to mean, it was terrifying to see Beckett so shaken. Best episode of Castle this season and probably my most favorite since Knockout. I knew the episode was going to be about 3XK from the trailer last week. The question was how were they going to do it. The fact that Amann wrote this episode around Lanie and Esposito was brilliant. They were the only two people who hadn’t personally been touched by 3XK. It brought a fresh approach to a very well played and unfolding story. As much as they have drawn Beckett’s story around Bracken I feel like they have done a flawless job drawing this story arc for Castle. The battle lines for Castle and Jerry Tyson were drawn in that motel room. It has been a psychological chess match ever since and I think it gives us Fillion at his absolute best. The idea that Tyson lives in Castle’s head was so prevalant throughout. I loved that you tapped into Fillion’s reaction shots because I completely agree. He spent the entire first half of the episode coming to the conclusion that his gut instinct on the dock was right. 3XK had lived and he was back. I love the shift Castle makes as he looks for the right moment to tell Kate his conclusions. It was a haunting creepy episode and Duncan’s score set the table as our 12th crew pondered what might have happened. The music was so menacing it was like a shadow lurking behind them. What Amann did so well was layer relief in throwaway moments so it didn’t feel like it was interfering with the plot at hand. Between his script and Bowman’s accute direction the gave viewers a 42 minute thriller that could hold its own against most theatrical film thrillers. Because while I fully expected 3XK to be at the center of this episode nothing that transpired as a result was expected. That is a show bringing its A game on all cylinders. The guests were terrific and you are so right Wersching made my skin crawl in a parallel that harkened back to Tyson and Castle’s conversation in the motel. I do admit I rewound my dvr just to make certain is wasn’t Tyson on the docks being run off in the opening scene. My absolute favorite thing about this episode was Lanie and man was it worth the wait. Her absolute freak out that prompts her to tell Castle to come alone was both insightful and a side we had not seen of Lanie. Her scenes with Espo heartbraking and that exchange in their final scene was simply devestating. They are intrisically tied to each other in a way that is not of their making or choosing and it will be interesting to watch how they move forward. Finally that last scene. Here’s my take. Beckett spent the entire episode denying and trying to convince Castle that Tyson was dead. She made herself believe it in Probable Cause. Unlike Castle who fundamentally believed Tyson was alive. So when that music plays it confirms what Castle already knew. Tyson isn’t done with them yet. The horror for Beckett is accepting and realizing Castle was right. It’s not over and with the partner it has gotten exponentially worse. Couple that with the reality that the stakes are higher because they are getting married and her reaction made perfect sense to me. Amazing review of an awesome episode. From the moment you started tweeting me about this episode, I knew it was going to be a good one. It’s definitely my favorite of this season so far and probably a new entry into my all-time Top 10. Everything came together so brilliantly, and, like you said, I love what they’ve done with Castle and 3XK—it’s such a personal demon for him, and the way this story has woven itself throughout the series has been exquisite. I think you’re also spot-on in your take on the final scene. I’m not sure the song has special significance for Beckett; I think it’s just her coming to the realization that they’ll never be safe from 3XK, and it’s only going to get worse now that the stakes are so much higher for Castle and Beckett as a couple. Great, great episode!! And great recap. I also love the 3xk stories the most of the dramatic plots. I agree that Annie Wersching was incredibly effective creeping me out. The end scene was chilling and I have to think there is more to the story behind beckett’s reaction. Unless this knowledge about 3xk being back somehow factors into the conversation about them having more children….I could see Kate really wanting kids but having reservations (job, mom’s case, etc) and knowinG that there is a psycho gunning for them could completely blow those dreams apart. However, my biggest takeaway from this is that I really, really don’t want TPTB to recast Tyson….the actor that has been playing him soooo creeps me out with his crazy eyes that I can’t imagine anyone scarier in that role. He scared me so much in the jail scene in Probable Cause that I can’t handle watching that ep anymore (even though IMO it is one of the all around best eps ever). So, I hope the dr girlfriend doesn’t change his appearance! Thank you! I completely agree about not wanting them to recast Tyson—the actor is just so good at being terrifying in a very subtle way. He’s actually in the movie The Proposal (in a very small part), and I freak out every time I see him in it because he’s supposed to be this lovable guy but all I ever see is Jerry Tyson. Great review of a great ep! I’m a big fan of the more dramatic ones as well, and like you said, I’m always impressed by this show’s ability to move from an insanely dark scene (like Kate and Dr. Nieman in the interrogation room) to one with easy banter (Castle asking for permission to annoy Beckett) without it feeling jarring. Especially when you consider that, like in last night’s ep, they often make these shifts in back-to-back scenes. Probably the last ep that was this dramatic was actually Probable Cause, which kind of makes me wish they would bring 3XK back more. But like you said, he’s a great villain, and I think part of his appeal is that they do use him so sparingly. So many good moments…loved that opening scene. It was sweet and very in-character for Castle and Beckett. I really appreciate the fact that the writers (at least for the time being) aren’t playing the whole “Beckett is jealous/sensitive about Castle’s ex-wives” card. She’s always been an extremely self-assured character, and I think it would ring a little false if they did try to do that. It’s fun to see Kate treat Castle’s previous marriages as kind of a funny annoyance (well, now where are we supposed to honeymoon!) rather than something that really bothers her. And I guess that was pretty much it for the sweet moments lol. The scene in the file room was extremely well done, and spoke to how well Castle and Beckett know each other. Beckett knows that Castle still blames himself, and I love that she tried to reassure him that it wasn’t, despite knowing that she probably couldn’t convince him otherwise. That line about not chasing ghosts was just great writing, and told an impressive amount about Beckett’s character growth with just one statement. And gah that last scene! Honestly, probably the creepiest scene they’ve ever done on the show, despite its’ simplicity. I know there’s a lot of speculation about it, which is why I think it had such a big effect. For the most part (with the exception of finales and 2-parters), Castle wraps up its’ cases in a neat little bow at the end of each episode. Even for the larger mythology story lines, we still get a sense of closure at the end of each ep; like “o.k. Beckett saved Bracken so he’s going to leave her alone for the time being”. For this ending, there was no closure at all. All we got was that song (so creepy in this context!) and tough as nails Beckett looking the most scared we’ve ever seen her. Castle looked scared too, but watching the scene, I got the sense that he looked scared more because of Beckett’s reaction to the song, rather than the song itself. Anyway, I think the scene came across so creepy because it was so unresolved. I know some people are speculating that the song means something to Beckett/Beckett and Castle, but I tend to disagree. I feel like they would have written at least one line of dialogue with Castle or Beckett explaining the significance if this was the case. Despite the fact that they kind of left things in the air for when 3XK/Nieman return, Castle has always been very dilliberate with its’ foreshadowing and call-backs to previous eps, and I think they would have made it more apparent if this song was something they wanted to give importance to later. My thought is that Beckett’s reaction was so strong simply because, after being in denial all episode, she finally realized that 3XK is back. Castle’s reaction was lesser because the song was acting as confirmation of what he already knew in his head was true. Anyway, that’s just my take. Already looking forward to next season or whenever they bring this story back! And I can’t wait for next week! That promo was all kinds of adorable and just what we need after this week’s crazy intense ep! Thank you so much for the great comment, Becca! You made some awesome points, and, like you, I think this was the best dramatic Castle episode since Probable Cause. 3XK is such a great villain, and I love that the show has two great dramatic arcs to build on (3XK and Beckett’s mom) because each one gives new layers to its main characters in different ways—3XK is tied more towards Castle while Beckett has her own arc with her mom. I also really liked what you had to say about the last scene. Your thoughts echo my own. It was so unsettling because it was unresolved, and that hardly ever happens on this show. It makes me hope for at least one more 3XK appearance before this season is done. I had the same thoughts as you about Ryan finding Santos’s body. His first instinct will always be to protect Esposito and Seamus Dever played all of the emotions running through Ryan perfectly. You said pretty much everything I wanted to say about the episode so I’m just going to end with praise for Stana’s face. While it is stunning, as the creepy Dr. Nieman pointed out, it was the complete look of terror that scared me the most about the end. The fact that she was so shaken made the ending song even more terrifying for me. It was a fantastic bit of acting on her part. It was such a great episode—probably the best of what’s been a strong season so far. And I agree—Stana’s face was the scariest thing about that last scene. To see Beckett so shaken by a song was enough to leave me unnerved for the rest of the night and most of the next day. Woah! I must quote Ryan from “Secret’s safe with me”: creepy, very very…creepy. Nice episode, scary and I loved the fact tha 3XK (or whoever) decided to hit those who weren’t hit in previous episodes (Lanie and Espo). 2nd: we saw Kate and Rick having doubts on way more “innocent looking” suspects in these 6 seasons. The plastic surgeon was creepy and clearly quite mad, so why our Detectives didn’t dig more on her? Anyway, Lanie Espo and Ryan were great in this episode, but still I consider “Number one fan” the best of season 6. Thanks for your reviews, as usual! As usual, we share the same thoughts about the episode (and it’s creepiness). Some of my favorite scenes were when Lanie called just Beckett down to the morgue (yay for showing their best friend relationship! ), and when Esposito took Lanie’s statement in the interrogation room. Those two moments really showed Tamala Jones’s ability to act, and gave more depth to those two relationships. I loved Lanie’s vulnerability and fear in those scenes where it was there but not overwhelming or overdramatic. I also loved seeing the bits of Ryan and Esposito’s friendship in their scenes together. Their relationship is probably my favorite after Castle and Beckett’s on the show, and I always enjoy seeing them trying to protect each other and support each other. It was nice to see that in an episode that could have easily gotten over-saturated with one of the relationships or the case, a balance between all the important elements of the story was there, including all the various relationships between our characters. At the end of the episode I too thought Beckett looked more terrified than Castle and I was waiting for Beckett to have a line saying something about how the song had some meaning to her, something like it was one that she and her mother shared, but I am grateful they didn’t go down that road since it would’ve broken my heart. (Or maybe they’ll tell us that later and surprise!break my heart :p) Whether it had special meaning for her or not, it was incredibly unsettling and a great way to cap off the episode while still keeping the suspense and creepiness that goes along with 3XK so that the audience knows we will see him again, probably later this season. Thanks for the comment, my dear, and I loved everything you had to say! I’m so happy you pointed out Tamala Jones’s acting in those two scenes because I thought she was beyond brilliant in both of them. It takes a great actress to play fear convincingly rather than over-the-top, and she did just that. It made me feel scared for her and not just scared in general, which was essential to making this episode really resonate. ” It was nice to see that in an episode that could have easily gotten over-saturated with one of the relationships or the case, a balance between all the important elements of the story was there, including all the various relationships between our characters.” – THIS. Hi Katie – I just wanted to write again and say what a joy it is to read your reviews and then read the various comments from everyone. I’ve stopped reading other sites because they focus on negative comments, name calling between participants and write extremely nasty comments about the actors of the show they profess to love. What you’ve provided here is nothing short of amazing. An environment where different opinions are encouraged and accepted. I don’t always agree with the comments but I do love the challenge of seeing things in a different light and even on occasion have been corrected on comments I’ve made (Linus the lion comes to mind here). You have a rare gift of been able to bring great joy with your positive writing, and that positivity infects everyone who contributes to this blog. Mark—Thank you so much for the kind words. The negativity I see in other corners of the Internet never fails to depress me, and I’m so happy that NGN has become a place where people feel they can share their opinions in a positive atmosphere. The way all of you as commenters have found a way to express your thoughts with such insight and also with such respect never fails to make me happy. I’m someone who feeds off positivity and can get very discouraged by oppressive negativity, so I’m proud to see that the comments here are a place where others can feed off positivity and feel free of the horrible negativity that plagues so much of the Internet. I’m humbled to think that I in any way contribute to the good vibes people get when they visit NGN, but I feel so much of that comes from my commenters—yourself included. I just try to write as honestly as I can about what I love; it’s you guys and your great discussions who really make this site feel like a place I’d want to visit even if I wasn’t the one running it.